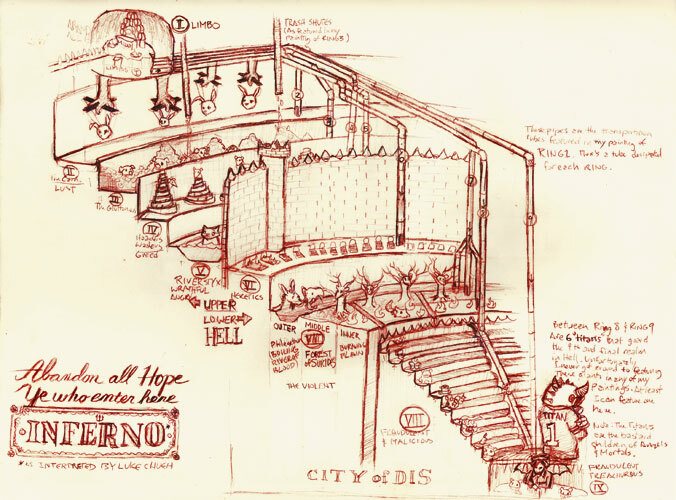 The idea to illustrate Dante's Inferno came to me about eight years ago, when I still lived in San Luis Obispo. At the time, I tragically found myself in a situation that familiarized me with Bob "The Price is Right" Barker's clothing line, (and if you don't know what I'm talking about, lets hope that you never learn). Anyway's, this "situation", coupled with an idea I was playing around called "Paintings for Children" where I paired cute childish characters with corrupt adult themes (inspired by the Joe Camel Cigarette controversy) helped me conceive the idea of taking "Dante's Inferno" and giving it the "Paintings for Children" treatment. But after doing a bit of research, I quickly realized that I didn't have the skills to effectively execute this rather complicated and at times abstract narrative. Even now, after painting full time for over five years, I'm honestly still not sure if I have the skills to do the poem justice. The Inferno's artistic legacy is huge; Botticelli, Doré, Dali, Rauschenberg, and countless lesser known artists have created works inspired by the poem. It has inspired a movie (acted out by paper puppets) and even became a video game. Most artists seem to stay true to the poem, focusing on "the poets" Dante, his guide Virgil, and Inferno's diverse cast of demons and damned. Rauschenberg approached Inferno by creating a painting for each of the 36 cantos. As for me, I've decided to remove Dante and Virgil, and instead create a painting for each ring of hell, with the exception of Rings Seven (a triptych - 3 paintings) and Eight (a deciptych - 10 paintings). I wanted to compose each painting in a way that illustrates what a "normal day in hell" would be like. In order for me to accomplish this, I had to take some personal liberties with certain details within the "Inferno," but I did my best to stay as true to the text as I could. Anyone who has read "Inferno" can tell you, this story is as crazy as it is confusing, and for the show, I published a guide that explained exactly what the hell was going on, why the painting is the way it is, and why I chose to do what I've done. The accompanying text for each painting was what I had written in the guide. Inferno was hosted by Gallery 1988, and opened on September 9th, 2009 (9/9/9). If you're interested in any of these paintings, please contact Gallery 1988 for availability.